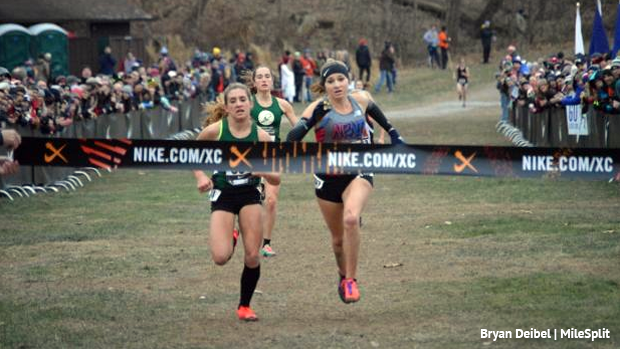 WAPPINGERS, FALLS, N.Y. - New Jersey ruled the Nike Northeast Regional Championships by capturing three of the four title as the Garden State advanced two teams and three individual runners to the National Championships at Saturday's meet at Bowdoin Park. The girls race was all Jersey up front as senior Alexa Westley of Warren Hills won a thriller over junior Chloe Gonzalez, who led NJ #1 North Hunterdon to its third straight title. Westley and Gonzalez staged an epic duel as both runners charged across the line together in 18:28.2 with Westley first by an eyelash. In the boys race, NJ #1 and US #10 Christian Brothers Academy packed three runners in the top nine on the way to a 99-108 victory over US #18 Bishop Hendricken of Rhode Island. With the victory, CBA advanced to the Nike Nationals for the ninth straight year. Senior John McGovern of Somerville and freshman phenom Charlotte Bednar of Hun also qualified for nationals. McGovern was fourth in the boys race 16:13.8, and Bednar, who ran side-by-side with Westley at the lead for much of the race, placed fourth in the girls race in 18:42.7. The top two teams and first five individuals not on a qualifying team automatically qualified for the Nike Nationals, which will be held this Saturday (Dec. 1) at the Glendoveer Golf Course in Portland Oregon. By placing a very strong third in the boys race, NJ #2 Haddonfield was hoping to earn one of the four at-large bids into nationals. But Haddonfield, which finished six points ahead of US #13 LaSalle Academy of Rhode Island, 134-140, wasn't chosen. LaSalle was coming off a very impressive 30-point victory over Bishop Hendricken to win New England Championships. The victory by the Wisconsin-bound Westley was especially satisfying for her after low blood sugar levels caused her to fall with 50 meters left in the Nike NE Regional last year. She got up and wound up 11th. In the boys team race, CBA's frontal attack was a huge key to victory as the top three for the Colts finished ahead of Bishop Hendricken's No. 2 man. The top three for CBA were Tim McInerney, sixth in 16:14.8, Luke Reid, seventh in 16:15.4, and Shaw Powell, ninth in 16:18.5. CBA's No. 4 man was Mike Morris, 44th in 17:00.5, and the No. 5 man for the Colts was Tristan Amell, who placed 52nd in 17:07.5 and finished eight spots ahead of Bishop Hendricken's No. 5 man. 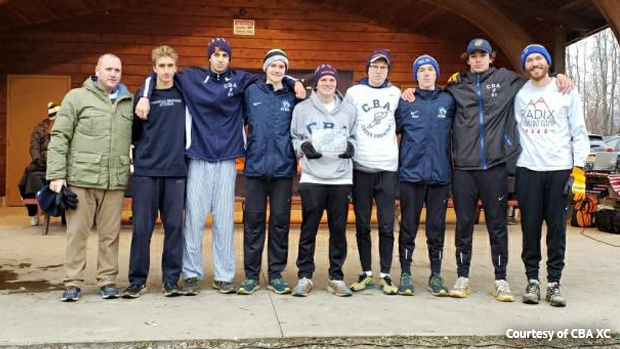 The victory by CBA, which averaged 16:35.4, avenged its loss to Bishop Hendricken in the Eastern States Championships last month at the Manhattan Invitational at Van Cortlandt when Bishop Hendricken finished first with 92 points and CBA was fourth with 190. CBA, second at the Nike NE Regional last year and seventh at Nike Nationals in 2016 and 2017, will be seeking its second national title next week. The Colts won it all in 2011. In the girls team race, North Hunterdon put five runners ahead of the No. 4 runner from Vermont's Champlain Valley on the way to 70-117 victory over Champlain Valley. NJ #2 Ridgewood was fifth with 196, Colts Neck sixth with 208, Holmdel seventh with 215, Metuchen eighth with 216, and Red Bank Catholic was 10th with 299. North Hunterdon, which averaged 19:28.9, was led by the dynamic duo of Gonzalez and senior Emily Nugent. Nugent came across right after Gonzalez, third in 18:40.5. North Hunterdon also received solid races from senior Ellie DiMarcello, 16th in 19:52.9, sophomore Alexandra Carlson, 21st 19:57.4, and freshman Addison Schmidt, 30th in 20:15.4. Delia Russo of Colts Neck, the Monmouth County champion, also had a very impressive race. The Penn-bound Russo placed ninth in 19:05.9, missing an automatic berth by just two places.